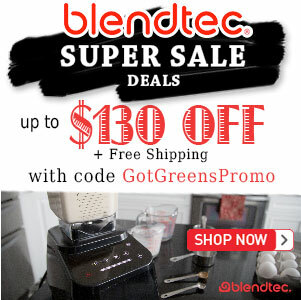 Cool Off with a Frozen Fruit Green Smoothie - Got Greens? The summer heat isn’t over yet. With record breaking temperatures of 108° cooling relief is always welcomed. Since Green Smoothies are a daily staple in our home it’s only natural to concoct refreshing, cooling recipes for those baking hot days. While it’s recommended to use only the freshest of ingredients when making your green smoothie, it’s perfectly fine to make use of frozen fruit to chill down your smoothie for a refreshingly cool elixir. 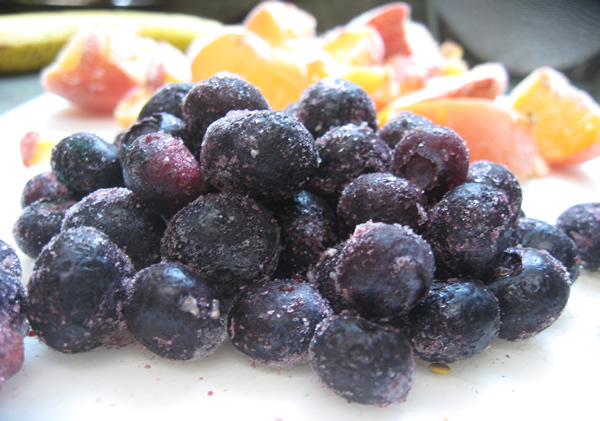 Actually, I recommend keeping a well stocked freezer full of fresh-frozen fruit. If you grow own fruit it is common to get overwhelmed with the amount of fruit that ripens at once. If you don’t grow your own fruit then take advantage of your locally grown fruit when it is in season to fill your freezer. One of my all-time favorite frozen fruits is peaches. 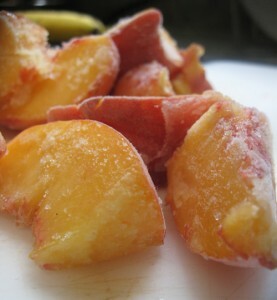 We would spend a couple of days making making peach jam, canning peaches, and freezing peaches. Nowadays, I no longer have a local orchard to visit for checks and my young peach trees don’t produce all that many peaches so I order organic peaches by the case from my local store. 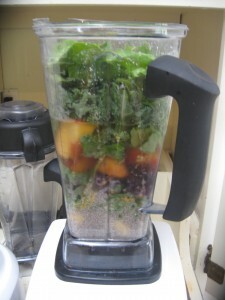 Today I made a most delicious, refreshing, green smoothie in my Vita-Mix with frozen blueberries, banana, and peaches. This smoothie is absolutely delicious, nutritious, and refreshing. 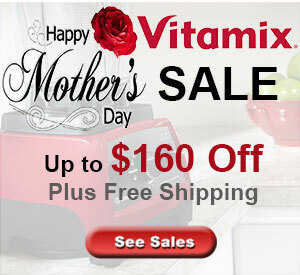 My son and I drank the entire Vita-Mix container full in an afternoon. 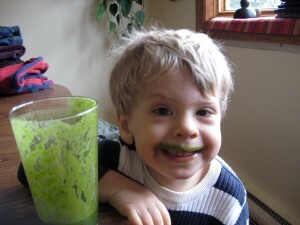 Be forewarned, this is not a very sweet green smoothie but that was part of the refreshing success for me. If you must have it more sweet feel free to add frozen dates. This smoothie hit the spot on this scalding day. Thank You!